Professional land surveying near Minneapolis requires the use of several tools to ensure the project is done correctly. Let’s take a look at some of the most important tools that Advance Surveying & Engineering uses on a regular basis. When we need to measure angles in the vertical and horizontal planes, a theodolite is the perfect tool. In fact, while this precision instrument is still mostly found in surveying applications, other fields like rocket launch and meteorology have found theodolites to be very useful. A theodolite is an adjustable telescope mounted within two perpendicular axes: one called the horizontal, or “trunnion” axis, and the other the vertical, or “zenith” axis. Today’s theodolites are exceptionally accurate, able to measure a targeted object down to milliradian or seconds of arc. A total station is an electronic theodolite paired with an electronic distance measurement. A total station reads slope distances between the station itself and a chosen point, and an onboard computer collects data. This allows us to gather data and execute advanced coordinate-based calculations for surveying projects. 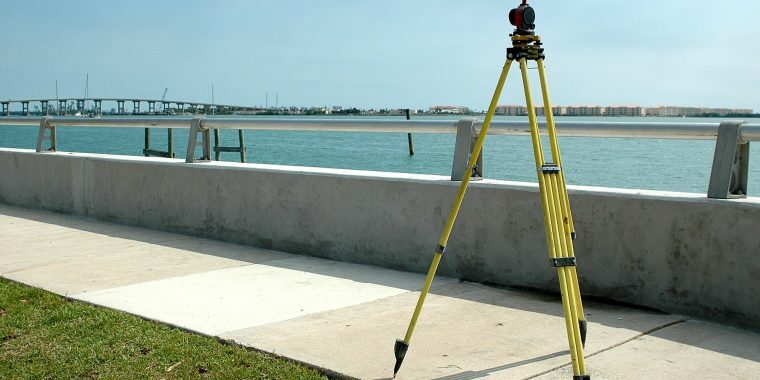 In recent years, robotic total stations have gained traction. Projects conducted with a standard total station require two people: one to operate the station and one to stand at the chosen point and hold a retroreflector (a device that reflects light back to its source). But with a robotic total station, one person can operate the instrument via remote control while simultaneously standing at the chosen survey point and with the retroreflector. One of the most cutting-edge land survey tools we use is the 3D scanner. This device analyzes an object or environment and collects shape-related data. This data is then used to build digital 3D models. 3D scanners are similar to cameras in that they have a cone-like field of view, and they can only gather information pertaining to unobscured surfaces. The biggest difference between the two technologies is that while a camera collects color information for objects within its field of view, a 3D scanner collects distance information for objects in its field of view. Thus the 3D scanner’s “picture” shows the distance to an object at each point in the picture. In order to generate a complete 3D model or the object/environment, it’s common for many scans to be needed from a variety of different viewpoints. A level is an instrument mounted to a tripod and employed to establish/confirm elevations of different objects on the same horizontal plane. Measurement typically commences from a benchmark – usually a known height calculated during an earlier survey. Today, the most oft-used level types are the automatic level and the digital electronic level. An automatic level is set on a tripod and automatically levels itself, removing the need for an operator to ensure the instrument is perfectly level. This makes for a faster setup time and easier usage. A digital electronic level removes the need for an assistant to hold a tape measure or graduated staff vertically at the object to be measured. The result is the elimination of a potential error source (the assistant), and enhanced accuracy. Contact Advance Surveying & Engineering today and we’ll expertly utilize these instruments for your next project.